The UBC Certificate in Immigration: Laws, Policies and Procedures Program (UBC CILPP) prepares students to impart excellent service and sound advice to clients, organizations and interested groups. 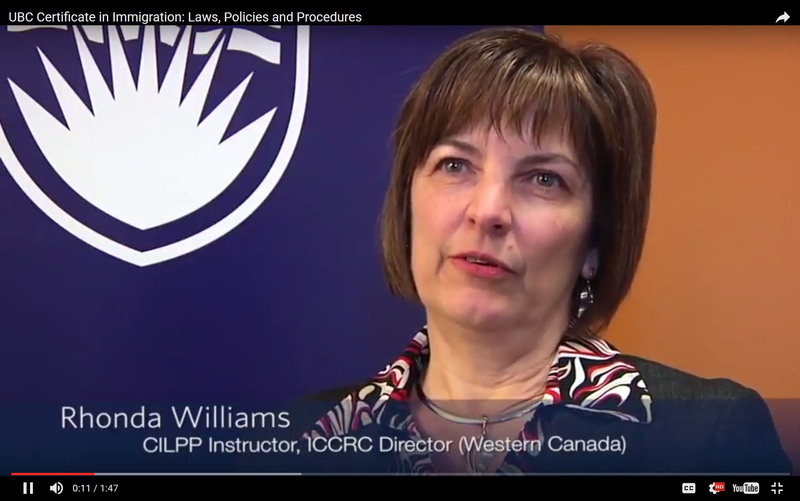 Accredited by the Immigration Consultants of Canada Regulatory Council (ICCRC), the UBC CILPP program is the first step towards becoming a regulated immigration consultant in Canada, and graduates have a high passing rate on the national regulatory exam. A wide range of professionals who work in the area of immigration will benefit from the program, including immigration practitioners, lawyers, paralegals and legal assistants, staff of non-profit organizations, educators working with international students, and human resource professionals. A respected standard of education in immigration practice that meets the educational requirements of professional organizations and ICCRC. The practical, theoretical and ethical understanding to start and operate a professional business practice in immigration. High level of flexibility with an online format. The program can be taken part-time or at an accelerated rate. The skills to be a self-directed learner while developing a network of fellow immigration professionals to draw upon in your professional practice. To obtain the UBC Certificate in Immigration: Laws, Policies and Procedures Program (UBC CILPP), you are required to complete all seven courses. The online format is designed to give learners the ultimate flexibility to complete the program from anywhere in the world. Students are strongly encouraged to complete all seven courses in sequence. The Introduction to Immigration Law, Policy and History course must be taken first, while the Practical Skills course is taken last. All seven courses must be completed within three years. All courses provide opportunities to practice critical thinking as well as develop oral and written communication skills, including filling out immigration application forms, relevant to the field of immigration consulting. Students are fully supported by instructors and interact with other students. Students should anticipate that they will need to devote a minimum of 18 hours per week in the part-time program (over 9 months) and 36 hours per week in the accelerated offering (over 6 months). The admissions process helps to ensure that the needs, intentions and expectations of participants are adequately matched to the program's objectives and capabilities. Before applying to this program you must read and understand the terms and conditions in the UBC CILPP Program Handbook. Please download and read the handbook carefully as it contains important information about the program and its policies. An English language test and minimum score are required for all UBC Certificate in Immigration: Laws, Policies and Procedures Program applicants. This requirement helps ensure that learners are prepared to succeed in our rigorous academic program. For more information and details go to Admission Process. Admission into the program requires all of the following four-steps. Please note that the submission of an application form and application fee does not guarantee a seat in the program if it has filled to capacity before the four-step application process is completed. Before applying to this program, please read and understand the terms and conditions in the UBC CILPP Program Handbook. Read the handbook carefully as it contains important information about the program and its policies, and online learning and assessment. Complete and submit the application form (fax, email, in person, or by mail). A non-refundable application fee of $175 must accompany your application. Receive a decision on acceptance to the program, by email. Approved applicants will be contacted directly by UBC Extended Learning to facilitate tuition options and official registration. The next offering of the program will start September 24, 2019. Prospective students are encouraged to submit their completed UBC CILPP application four weeks prior to the program start to allow time for the application process, course registration and to take advantage of the early bird discount on your tuition fee. The total tuition cost of the UBC CILPP program is $8,820, plus a $175 non-refundable application fee. Note: For the Winter 2020 6-month accelerated part-time program (Jan 21 to Jul 26, 2020), you will be taking two courses at the same time starting Feb 25, 2020 and your workload for the week will double. Please note: You must successfully be accepted to the program before you can register for the courses by completing the Application Form and paying the $175 non-refundable application fee. All required reading materials are included in the program fee. The primary readings for the program are the Immigration and Refugee Protection Act and Regulations. Students will need access to updated versions of both in the format of their choice. You will be provided with additional required reading materials for each class, including examples of immigration cases. There is no need to purchase any textbooks. You will also need Adobe's Acrobat Reader to view the pdf documents in the program. Download the free reader. Students do have the flexibility of completing the courses in three years if they cannot or prefer not to do them consecutively, as long as they start with the Introduction to Immigration Law, Policy and History course and end the program by taking the Practical Skills course. You are assessed on each course according to UBC and ICCRC assessment guidelines to ensure you are successful in acquiring the skills and concepts needed to practice in the field of immigration consulting. Assessments include written assignments, quizzes, practical assignments and an examination at the end of each course. To graduate and receive a UBC certificate, you must complete all seven required courses, earning an average of 70%. The UBC Certificate in Immigration: Laws, Policies and Procedures Program is taught by lawyers and practitioners highly experienced in the field of immigration. The instructors are members in good standing of the Canadian Bar Association or of ICCRC and have a broad scope of experience and knowledge in their area of immigration law, policy and procedures. They are able to draw upon a depth of examples, cases and practical experience from actively managing and conducting responsible and ethical practices of their own. Learners who withdraw from the UBC CILPP program or course 21 days before the program or course start date will receive a full refund, less a $150 cancellation fee. If you withdraw with less than 21 days notice, you should notify UBC Extended Learning in writing of the reasons for the withdrawal. After this date, tuition fees are non-refundable, except for serious reasons such as bereavement or a documented medical condition (supported by a doctor's letter from a practising medical physician in Canada), in which case the refund will be processed on a pro-rated basis for the unfinished portion of the program. The refund will be pro-rated from the time the doctor's letter is received by the administrative staff and the $150 cancellation fee will apply. Should the learner decide to return to complete the remainder of the program or course after his/her withdrawal, applicable tuition fees will be in accordance with the most current tuition fees, and not that of the cohort for which he/she first registered. Students are expected to complete the UBC CILPP program within three years. Otherwise, upgrading of knowledge may be required to meet the education requirements of ICCRC.